An unlikely SEC vs. Big East meeting in Charlotte, N.C. could be the best neutral site game in the entire 2018 NCAA tournament. Texas A&M (20-12) comes into the Big Dance as the West Region's No. 7 seed with something to prove in a "Jekyll and Hyde" type season. After jumping out to a blazing 11-1 start, the Aggies dropped 10 of their next 16 games and lost to Alabama, 71-70, in the first round of the SEC tournament. Billy Kennedy's team reached as high as the No. 5 spot in the Associated Press poll with impressive wins over No. 11 West Virginia and No. 10 USC. All prior to a five-game losing skid, but nonetheless a second trip to the round of 64 in Kennedy's seven-year tenure at College Station. With an absence from last year's tourney, the Aggies advanced to the sweet 16 in 2016 before being stopped by Oklahoma. A matchup against the No. 10 seed Providence (21-13) could be a one-and-done scenario for Texas A&M's hopes of advancing to the round of 32. 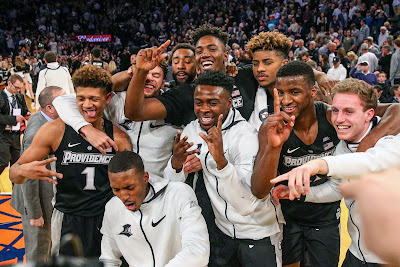 The Friars ended the regular season with a deep run in the Big East tournament by beating eventual No. 1 seed Xavier and Creighton in overtime before losing to Villanova, 76-66, in the championship game. This marks a fifth consecutive NCAA tournament appearance for Providence under coach Ed Cooley, who's led the Friars to a 144-93 record since taking over in the 2011-12 season. Despite finding success, Cooley has yet to advance Providence to a sweet 16 run. Both teams struggled to overcome a tough conference schedule with eight losses each, respectfully. Providence had a deeper run, but will have to play as a better second half team against A&M. The Friars were outscored by their opponents in the final period fifteen times this season, resulting in four losses against ranked teams. On the other hand, the Aggies are dealing with the loss of point guard Duane Wilson and ended the season with a 3-4 record in the last seven games due to a weakened backcourt. Providence has three players averaging double-figures with Kyron Cartwright, Rodney Bullock and Alpha Diallo contributing a combined 38.8 point per contest. Texas A&M's future NBA frontcourt duo of Tyler Davis and Robert Williams is a huge reason why the Aggies were bumped off being a bubble. Davis leads the team with an average of 14.5 points along with 8.8 rebounds. Williams holds down the middle as a hybrid forward/center, averaging a near double-double with 10.3 points and 9.0 rebounds. Both Davis and Williams helped Texas A&M earn a top five ranking for rebounds per game (41.3). Both teams are almost even when it comes to overall scoring. Texas A&M maintains an average of 75.0 points per game (144th) compared to Providence's 73.7 (175th). The winner of Texas A&M/ Providence will go on to meet the winner of No. 15 seed Lipscomb (23-9) and No. 2 North Carolina (25-10). The Tarheels' defense of their national championship starts off 140 miles from campus being favored over the Atlantic Sun champions Bison. An eventual winner out of the four teams will advance to the semifinal round in Los Angeles, Calif.